Relationship change and growth are adventures into your heart and soul. You have to develop a solid sense of yourself, deal with adversity against your picture of yourself , and create a personal relationship with yourself, to live in an I-style of relationship. After solidifying this experience and developing a sense of trust that you will not sell yourself out, you can begin to move into a We-style of relationship. An I-style of relationship is a stepping-stone to get to a We-style of relationship. This is because you have to develop boundaries first (I-style) before you can be flexible with your boundaries in a dynamic way (We-style). The interdependence of a We-style of relationship allows for strength of self and connection to other, simultaneously. The We-style of relationship incorporates support of the individual and collective goals and needs with a dynamic, flux movement between the resources of the relationship toward whatever of these needs attention at any given time. This requires strong boundaries and flexibility in the interdependence of the two individuals and the third aspect, the relationship or partnership. So that rather than ½ + ½ = 1 (me-style) or 1,1 (I-style) you create a situation where 1+1 = 3, or more than the sum of its parts (we-style). The picture of the We-style of relationship includes two wholes and a third aspect, which is the area the two individuals overlap to create the relationship vortex, o()o (view this symbol as two circles overlapping each other to create an inner vortex). Fear can really be a block to change, embracing the attitude of adventure can reframe your fear into excitement, offering an energy or anticipation to help you to flow with the change rather than block or freeze when faced with change. This is how boundaries work. Boundaries create a definition. They clarify this is me, and this is you, through defining where you end and another begins. This clarification creates a deeper understanding of each individual and also how couples, partners or groups coexist and share goals. From the defined individual space, the boundary, you can create the space for a sense of oneness and togetherness. Flowing through the process of change begins with gentleness. Boundaries assist in creating an internal container, so that you can move through a process of change more harmoniously. Creating boundaries comes out of self-love, and love toward your partner. The clearer you are about you and other the better you are about defining what you want and what you can give in relationship. Boundaries increase connection. Categories: Balance of Spirit Mind and Body category, coaching category, consciousness development, Gestalt figure ground, Mindfulness living category, Paradigm shifting, spiritual development | Tags: attitude of gratitude, balance, change, consciousness development, effective communication, faith, gestalt figure-ground, inner balance, insecurity, me to we, paradigm shifting | Permalink. trust yourself, or If you meet the buddha on the road kill him! Trusting yourself is not only believing in yourself it is also listening to your intuition and sense impressions and acting with a sense of internal power. A common way you diminish self-trust is when you dismiss your inner knowing and listen to another’s interpretation to get approval. This is a risk in any student role. In therapy, there is a saying that if you say I already worked that out or I already resolved that conflict you are possibly tricking yourself. It’s a sign of resistance, especially when said adamantly or defensively. The key is to discern if your resistance to an interpretation is due to a true inner sense of truth or a deflection of the truth. –> if you are responding in a neutral style regarding how it just doesn’t feel right and you evaluate the information, then the other may be projecting onto you something through her interpretation. I wrote a bit about this last year in this post https://instinctivehealthmedicine.com/2012/04/09/truth-within-inner-guidance-i/. I was reminded of this thesis over the weekend while attending an intensive Yoga workshop. Many of the participants were my teachers, whom I respect deeply. I love Yoga, and although I am a Yoga-neophite, I had decided the best way to learn was to stretch-myself (no pun intended) and do my best. The focus of the first day was to work on inversions and transitions between poses; focusing on the importance of transitioning into a pose not just the pose itself. I loved the idea behind it as it allowed for seeing the divine in the space between, something I am drawn to experience daily. I was grateful to pair up with my favorite teachers and found that my willingness to let go, play with the work, and surrender led me to a powerful shift in my practice. On the second day, the focus of the work was to elucidate how, when, and where you feel blocked in a yoga pose, to surrender to the block, and allow a break-through. The poses that were being utilized to enlighten each of us were bent inversions so that arching, opening the heart chakra and pelvic space and lengthening the spine were paramount. Flexibility in your hips and shoulders are important to get a good back-bend; they are also the spaces in your body where you collect and hold hidden trauma both physical and emotional. This style of workshop offered a perfect opportunity to work-through an energy-holding leftover from earlier traumas, as long as the guest teacher could also provide a set of tools and a trusting space fo release. Our guest teacher identified at the beginning of the workshop that she had not previously taught this particular workshop and stated in her opening mantra that it was important to not interfere with another’s lesson by showing them how to work through their blocks. Her remarks were incongruent with the presentation she provided on her website and the description of the class goals. As I sat preparing to risk and surrender to the lesson, two things stood out in my sense impressions: one, she was in a position of guide, yet identified at the onset that she was against guiding through blocks; and two, although she had an excellent reputation, this class was unexplored territory. We worked through many different exercises to open shoulders and hips – paramount for backbends. The pace was quick and often we broke up into dyad partners to work on our assignments. This increased the opportunity for intimacy yet reduced a chance for clarification and guidance from the guest teacher. We felt at times like the blind leading the blind. 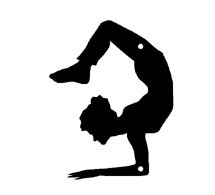 After much headstand and handstand practice, the guest teacher decided to use me as an example of how to assist your partner through what my gymnast-daughter calls a ticktock, and in Yoga is called Scorpion Vchikasana. For non-yogis it’s a handstand and then with great control you bend your legs over your head so your feet touch your crown. This is a pretty awesome and advanced Yoga position. I was excited to experience what it felt like to get into the position; I knew that once there I could create a body memory so that when I practiced on my own I could correct it with clarity. I enthusiastically kicked up into a bent arm handstand, anticipating her to catch my leg and move me over into the bent inversion. Instead I heard a laugh among the participants as she grabbed it forcefully and rotated it inward, this jarring maneuver caused me to lose my focus and I fell right back down. My enthusiasm dropped. She said kick up again. I did, albeit more cautiously this time. Hopefully, I waited for her to gently move me over into a backbend, she did not, I held until I couldn’t any longer, fell down and kicked up again, waited, kicked up again, attempting on my own to shift the weight of my hips over my chest, and feeling a bit confused I fell back down. She said kick up again, come on. I stopped and looked up at her. I was confused as to why she was not demonstrating moving me over into the backbend. She looked at me and said what’s ging on? What are you feeling? I said I feel weak. She said well you are stopping yourself and referenced the cause as my inner negative dialogue. She said do it again. I dutifully reset myself and I slowly and perseveringly moved my leg up into a handstand: first one leg and then drawing my other leg to the handstand trying to stack my hips over my ribcage, still expecting her to assist moving me into position, I kept waiting for her to gently move me up into position and then stand in front to move me into the scorpion position….but nothing….dead space, my arms and legs over-worked…I came back down onto my mat, flat. She moved away to the front of class, never having actually demonstrated moving me into position, and then looked back at me sideways and said, you are strong enough to do it, you are fighting yourself, you need to change your inner dialogue. I felt a familiar conglomeration of disappointment, vulnerability, defeat, and confusion. Somehow I had been triggered. I felt a combination of having been tricked by her and an inability to stand up for myself and realign internally with my strength. How had I given my power to this guest teacher? I felt shamed by her in front of the class. This was a powerful moment for me to deduce the etiology of my holding and my fear. I had not heard any negative self-talk. I searched inside myself, what am I hiding from myself? What I noticed was a defense mechanism of holding and protection that increased the more I interacted with this guest teacher. What was that about? . In my head I was trying to make sense of what had happened and what to do next. Was she doing this on purpose to help me move through my block or was her action more sadistic and so recreating an earlier trauma that my personal intention for the class posed as an opportunity for release? After reflection, and discussion with other students in the class, some of whom were new to me, my concerns about the negativity of the situation from the guest teacher were corroborated. Their observations were consistent with what I observed and felt. Her actions exacerbated my hold and blocking rather than assisted me to move through the physical block. This is the opposite of how the workshop was billed. I had a funny feeling from her, as if she was not really there, not really centered on the role of being a facilitator but rather focused on being an exhibitionist. Although some of my teacher-friends really liked her others later identified a similar set of concerns. My holding was indeed an aspect of my trusting myself; my body clearly ‘heard’ that this teacher was not trustworthy, so surrender was unsafe at that time -> this was the me fighting myself –> I was trying and I was stopping myself. My mind was directing the trying and my body was directing the stopping. My ‘block’ or resistance was a holding within my body in response to her passive hostility. This holding did not develop in response to her. It pre-dated the workshop as a survival mechanism from previous trauma; it was indeed the thing I took to the workshop to work-through. This guest yoga teacher had designed a class to learn how to work-through holding and physical blocks without understanding a fundamental component needed to complete the task; to surrender and allow – Trust is required. In order for a teacher to encourage a shift in holding within her student her presentation has to include a lack of aggressivity, and a consciousness of beneficence; she need not be a cheerleader but rather have an unattached spirit of generosity. This renowned guest yoga teacher gave mixed messages though her words and actions which created a lack of trust needed, thus she had set up a class wherein re-traumatization could and would occur. The choice to shift and uplevel lies solely in the power of the individual. Trusting yourself, surrendering to your truth includes paying attention to when resistance is beneficial and a positive communication from your personal sensory guidance system. Timing to uplevel matters, allow it to be guided from within(yourself), rather than without (another). Sheldon Kopp wrote: No meaning that comes from outside of ourselves is real. The Buddhahood of each of us has already been obtained. We need only recognize it – Thus the Zen Master warns his disciple: – If you meet the Buddha on the Road, Kill him! (Kopp, 1976). Categories: Balance of Spirit Mind and Body category, coaching category, consciousness development, Mindfulness living category, personal development category, spiritual development | Tags: attitude of gratitude, balance, change, consciousness development, discipline, inner balance, instinctive health, internal sensory guidance system, namaste, trust yourself, truth, Yoga | Permalink.